Each recipe is associated with a list of directions and a list of ingredients. Since ingredients are variations on specific items, they are not distinct grocery list items. For example, one recipe may call for 2 tomatoes and another may call for 3 tomatoes, and each would be a separate ingredient, but only one grocery item with a combined total of 5 units. Grocery items also have alternatives in a self-referential link (ALT_GROC_ID), which would be appropriate for recipes with "or"s in the ingredient list or legitimate alternatives (e.g., sea salt for salt). Then there are the weekly plans, called "Lists". I realized this term may cause some confusion between grocery lists and plans, so I may change it in the future. For now, I'm focusing on completing the functionality of the database and not improvements to the delivery. Each list is associated with a beginning and end date ("from" and "thru" on the Lists table). Each list has several detail lines in the Lists_detail table that associates days with meals for the days between the beginning and end dates, inclusively. Each meal is then related to a recipe. Currently the database exists in a Microsoft Access database, and eventually I would like to port it over to SQLite or something similar, with HTML forms. For now, there are several Access forms for data entry, and the initial "Start" form that opens with the database provides access to many of those forms. The top section of buttons appends new plans to the Lists table with different start dates. For a typical week, a user might start planning on Saturday for the next week Sunday - Saturday and the following week Sunday - Saturday, and would thus start two new lists using the Tomorrow and "Week from Tomorrow" buttons. The two new lists would be associated with today's date, which is displayed in the upper right hand corner. Once the new lists are initiated, the user can open them by using the "Today's Plans" button in the "Open..." section. 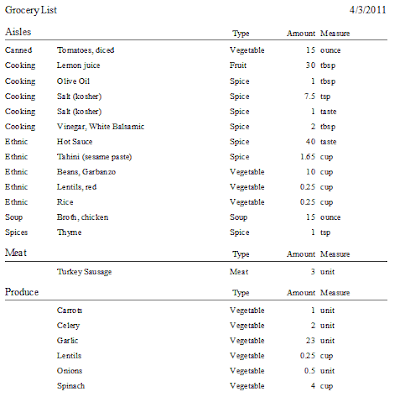 The user can also open recipes for viewing and the grocery list based on today's plans. 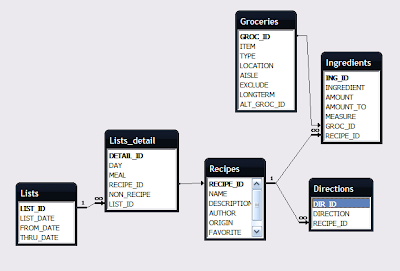 Eventually I'm going to switch the grocery list from a view-only report to a form based on an append query, which would keep track of the lists through time and build an inventory of the kitchen. (This is where the confusion with "lists" would come in to play.) 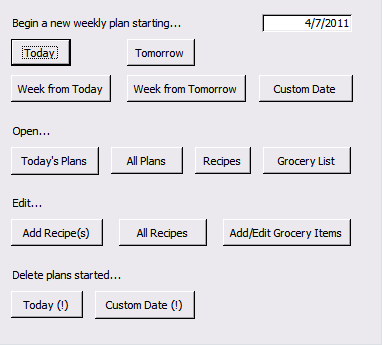 Also from the start form, the user can also add or edit recipes, add or edit grocery items, or delete plans. The list date range is the first section, with arrows allowing the user to switch lists. The navigable lists depends on how the user opened the form based on the buttons in the start form. The user then uses the drop-down boxes to select days and meals. 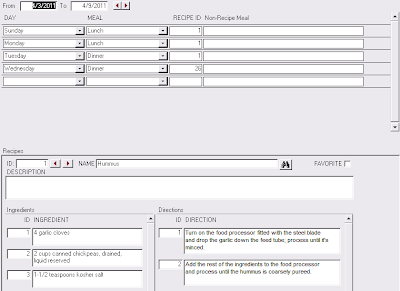 Next, the user can use the bottom part of the form to look up recipes. Say the user wants a rice dish, so the user clicks on the binoculars and searches the Name field for "rice". Currently there are fields for descriptions, authors, origins, and URLs for recipes, which could also be added to the form to help the user find a particular recipe. There is a lot of work still to do. As I mentioned, I have to figure out how to append the grocery lists to a list table to maintain a history. Then, I need to enter a lot of recipes. The recipes in the database currently were entered using a SAS program and borrowing work's SAS server to process it. The next recipes will be entered using the new form as a test run of how well it works. I expect I will revise the form quite a bit to make it flow better. I also have to figure out how to merge disparate measurements, e.g., cups and ounces, and only display a total quantity on the grocery list. Some merges will not be possible, as the above image shows for kosher salt: 7.5 tsp and "to taste". (Note the odd "40 taste" - this is a conversion of the ingredient "8 dashes of hot sauce", which is unquantifiable, and the dummy records I entered had 5 of the same recipe, thus "40 taste".) Then there's the conversion into a "better" database tool and using web forms instead of these proprietary-format forms. For now, though, I am very happy that the database, although not fully populated with recipes, is usable and can save the user (just my wife, for now) a lot of time. This is neat...ever finish it up? I'm still working on it. I have a rough idea of how to do this with Python and HTML, but other than that, I really need to find the time to do it.